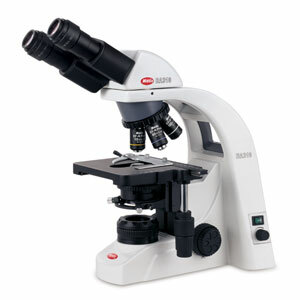 The Motic BA310 Binocular is an exceptionally versatile laboratory microscope designed for the complex and rigorous work performed in advanced teaching and laboratory situations. The microscope is a superior scientific instrument that was created to perform meticulous analysis of microorganisms and cells in a professional setting. This compound, high performance microscope offers uncompromised optical clarity due to its Color Corrected Infinity System (CCIS) optics. It also caters to a complete range of microscopy needs, all handled superbly thanks to Motic's brand new, state-of-the-art CCIS designed objectives. The BA310 Binocular's superior lighting comes standard on this series with a built-in transmitted 6V/30W Quartz Halogen Koehler illumination. This highly sophisticated system includes intensity controls that provide users with a powerful, adjustable light source to meet the delicate and detailed lighting requirements for viewing virtually of any specimen. In fact, the Koehler illumination will dramatically improve user viewing of even the most obsolete specimens. Slides rest securely on its large, hard coated, chemical resistant 175x40mm stage with an expansive 76x50mm travel range. A key component of this remarkable stage is its completely redesigned slide holder that guarantees a tighter grip to ensure easy and repeatable scanning of numerous slides throughout your day-to-day routine. The binocular microscope is easily upgradeable to allow for additional phase contrast & darkfield methods, thus ensuring that this model will provide maximum functionality to all users, in a variety of settings. A full complement of options and accessories are available to ensure that your microscope available for customization to meet your specific microscopy needs. Focus Coaxially positioned control & fine knobs, coarse 42mm/rotation, fine 0.2mm/rotation. Min. increment 2µm. Coarse motion torque adjustable. Brass Gears.